Burbank, CA – A statue of Ark Yuey Wong, the “father of kung fu in America,” is set to be unveiled this Saturday, February 22 at the Martial Arts History Museum. A bronze bust, designed by Mexican artist Ulysess Alvarez Barron, will be formally placed into the museum by the grandson of Wong, Seming Ma. Ark Yuey Wong was born in 1900 in Canton, China and mastered the art of kung fu during his training at the Shaolin Temple. He immigrated to the West in 1920s and became an herbalist and highly acclaimed acupuncturist. He began teaching kung fu in Northern California to a group of Chinese relatives and students. 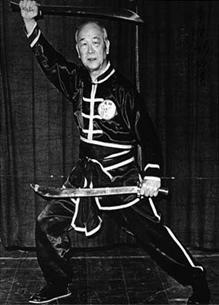 Contrary to Hollywood's depiction of history, it was Ark Y. Wong who is credited as the first Chinese master to teach kung fu to non-Chinese students which has spread to every nation in the world. “Because of the courageous act of Ark Y. Wong, kung fu has extended across the globe. Today, you can find kung fu schools in Russia, Saudi Arabia, Peru, Australia and more,” notes Martial Arts History Museum's president Michael Matsuda. The influence of Wong can be felt in a variety of Hollywood films such as “Kill Bill,” “Kung Fu Panda,” “The Matrix,” “Man with the Iron Fists” and more. Kung fu has also been instrumental in the development of cartoons and television shows such as “Avatar: The Last Airbender,” “The Green Hornet,” “Xiaolin Showdown,” and more. The tribute to Ark Y. Wong will begin at 4 pm. For additional information on the event and the Martial Arts History Museum, visit their website at Mamuseum.com. The museum is located at 2319 W. Magnolia Blvd., Burbank, CA 91506. The Museum is a non-profit 501(c)(3) organization. Email: info@mamuseum.com.